On the Request tab, select the "Other" option next to "Create Ticket For"
In the Client Lookup box, enter the client's first and/or lastname and click the "Search" button. Note that you will only be searching for clients that you have been granted access to. Once the desired client has been found, select their name. It will then be populated in the "Other" field. 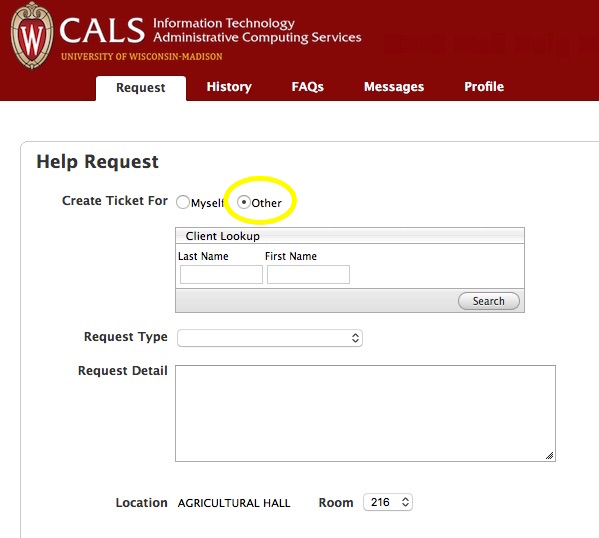 Select the request type from the drop-down box. Once the ticket has been created, you will receive a confirmation screen with the ticket number assignment. In addition, both you and the client you're submitting for will receive an email confirmation of the ticket creation and ticket number assignment. The body of the confirmation email will also include a link to check the status of the ticket as well as links for adding notes to the ticket or canceling the ticket. Once you've submitted a ticket on behalf of another client, you will be able to view the ticket online under the History tab.